Tag: The Blogger Made Me Buy It! 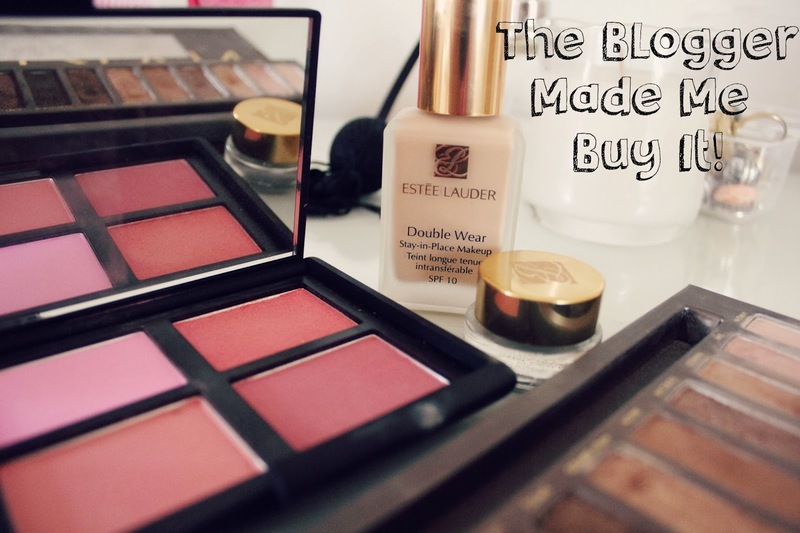 I was tagged by the lovely Katie from Sugar Fixx Beauty to do the Blogger Made Me Buy it Tag! It was originally made by Danniella from Famous in Japan so make sure to check out their answers to the questions! I would definitely say Vivianna from Vivianna Does Makeup, I always end up purchasing products she recommends! I rely on both Temptalia and Cafe Makeup for product swatches and reviews. If I'm looking to buy something, I generally google it and find as many reviews as I can from different bloggers, this is also such a great way to find new blogs! If it's a foundation, I also have a look on youtube at foundation routines, to see the product in action! Probably the Naked Palette and the Naked 3 Palette! I love them so much, they are perfect if you generally wear more neutral eye looks. Blogs definitely encouraged me to buy these, especially the Naked 3 Palette, there were so many blog posts about it, I couldn't resist! I rarely buy products that I end up disliking, I tend to only not get along with a product if it breaks me out or doesn't work on my skin type. My least favourite product would be the Liz Earle Cleanse and Polish and it completely messed up my skin. I then decided to give it another go and it screwed it up again, it's never been the same since! *sadface* It's such a shame as so many people I know use it religiously and adore it! Urban Decay Naked 3 Palette, Giorgio Armani Luminous Silk Foundation, Pixi Glow Tonic, Nars Guy Bourdin One Night Stand Palette, Anastasia Brow Wiz! I would have to say the Nars Guy Bourdin One Night Stand Palette, I'm not even into blushers that much but after reading reviews I just had to buy it, I'm glad I did, it's beautiful! I think the crazy amount of blog posts on this palette made me want it more and the fact that it was limited edition! I wasn't fussed about the Rimmel Apocalips, I have looked at them a few times in Boots but the shades just don't appeal to me for some reason! Most things I buy, I look up reviews for but sometimes if I'm in Boots or Superdrug and I see something that looks interesting, I'll pick it up! Interesting post. I also didn't get into Rimmel Apocalips for some reason. I think no shade suited me well enough, even though it seems to have a good formula and pigment. I wish I could get my hands on the NARS blush palette. It's so gorgeous but I can't find it anywhere. It doesn't help that it gets so hyped up.